Happy Father's Day to all the dad's out there. As always, I made my card too late to mail one to my dad. I did give him a call though. I started on my father's day prototype last night until the wee hours of the morning. After the third failed attempt, I decided I needed to sleep on it. Went at it again today and came up with something acceptable and then made a card to match. I made a small photo wallet from a Tyvek envelope. Tyvek is a trademarked plastic fabrication by Dupont. It is water resistant and tear resistant. I bought a small box of 6x9 envelopes from U-Line with the intention of using them as hinges for mini albums to stand up to much use flipping though pages and not tearing around binder rings. I used glossy accents on the key on the front and back. The map and compass paper are the two sides of a patterned paper by Reminisce. (It's really pretty!) The key is from a single sided paper from Michaels Recollections line. I fussy cut the keys out. This wallet has five pockets and five tags. I only decorated one side of the tags. The wallet is just over 4 inches by 3 inches, so it will hold wallet sized photos. More than one will fit per pocket, but I felt 5 was a nice complete set. The tags are all metallic brown cardstock. I fussy cut the elements from the papers. They white keys are embossed. The white keys and the clock-face and hands I stamped from a Close to My Heart stamp set. My father-in-law didn't flip through the pockets or look at the tags but I'm sure once has some pictures for it, he will figure it out. I posted my dark lace long mailbox earlier, but it wasn't the first attempt at a mailbox. The first one, I wanted to be a full blown post box. I wanted to make it Christmas red and have a drawer type opening and a "locked" compartment in the back. The idea was was, children would drop their letter to Santa in and it would magically go to the North Pole over night. As a play Post Box, I thought if I made an opening in the back, my nephews could pretend to be the mail man who has to "unlock" the box to take out the mail. I always intended legs for it, but at this point I was focusing on that drawer drop box opening. I used a wooden knob I got in a pack on sale at Michaels Craft Store and painted it black. I used a magnet closure and a metal washer. If I do this style again, I will place the drawer sides in a slit in the face of the post box so they don't flop around. Also, I will cut in to the face of the post box to make the top only a semi-circle so the door doesn't appear flat in a rounded top. I like the back "locked" compartment. It's big and fun for children to pretend to get the mail. Taller and slimmer was the needed shape. No drop box opening, just a drop slot. The body cavity opening is in the front and uses a simple tuck-tag design. A side with embossed trees. The other side, below, just plain. I used chipboard to make the sides and bottom. The cardstock is a thick DCWV Luxury Stack cardstock. I've had this paper for 5 years. Fantastic to use it up! I painted the edges of my chipboard with a Ranger pearl white paint dauber. I like the texture of the dauber tip and the pearl white matched the paper flawlessly. I also painted the edges of the darker blue cardstock (best visible in the close up of the embossed trees). I submitted this to the Accucut Craft Grandemark challenge in the chipboard category, but I didn't win with any of my submissions. I still quite like it. I hope I find the time to make another before November. I want to give one to each of my sister and sister-in-law's household for their boys to write their letters to Santa. I know most kids email Santa these days AND get a response too (quite cool) but I like the tradition of a letter to Santa. Your own genuine wishes in your own genuine hand writing. The idea of seeing it progress year over year along with your fondest desires just tickles my fancy! I graduated the colours using the butterflies: purple-blue, green-yellow and red-orange. The cardstock is a textured cardstock to simulate the fabric of the quilt. I also polka-dot embossed the mounting squares to add more texture and inked around their edges to provide more separation from the background. I made the little rolled flowers for another project but didn't end up using them. 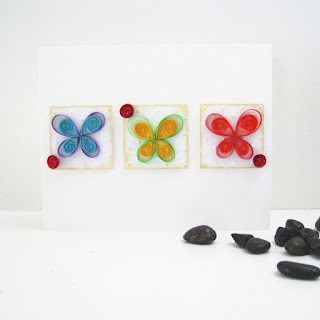 So, I blobbed some red Stickles glitter glue in the centres and added them to my card. It was fun participating in this challenge! 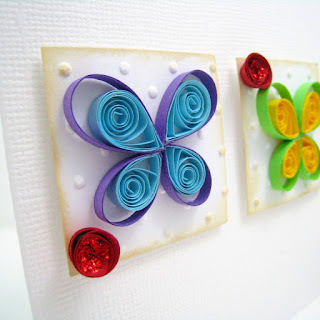 There are a lot more photo inspiration challenges in the line up, so we'll keep our paper quilling creativity flowing. 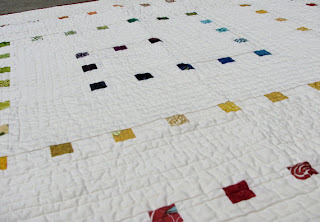 Check out the Paper Twirlies Blog to see all the other entries inspired by this quilt!